Interior designer Alina Wolhardt of South End-based Wolf in Sheep Design helped Li Ward, the pet and wedding photographer behind Fat Orange Cat Studio, and her husband, Dan, transform a rarely used, cluttered guest room into a lush sanctuary with a Victorian vibe. To start, they painted the walls “Gray” by Benjamin Moore. “We created a yin and yang effect; their bedroom is light, white, and airy, and this is dark and moody,”Wolhardt said. Wolhardt emulated a starry night sky using On the Rocks, wallpaper in “Metallic Eggplant” by ROMO, and a hand-rubbed antique-brass Soleil pendant by Suzanne Kasler for Circa Lighting. “When the light is on, the ceiling sparkles and glows,” Wolhardt said. 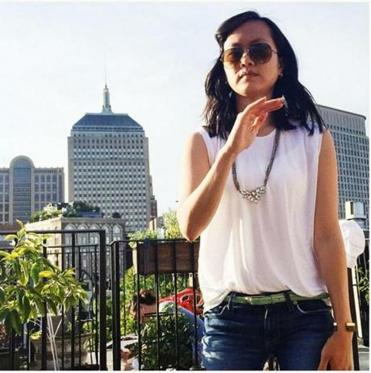 South End resident Li Ward moved to the area to attend Brown University, and stuck around after falling hard for New England. This heavy, carved piece, which originally belonged to Li’s parents, was relocated from the master to anchor the room. It acts as a bar and holds Li’s calligraphy supplies. The moody black-and-white photo picturing a bride in a cemetery is part of Li’s “Ghost Bride” series. “When I saw this on her website, I knew it would set the tone for the room,” Wolhardt said. She placed other pieces, some existing and others acquired together at the Brimfield Antique Show, in such a way so that thecouple can add to them. 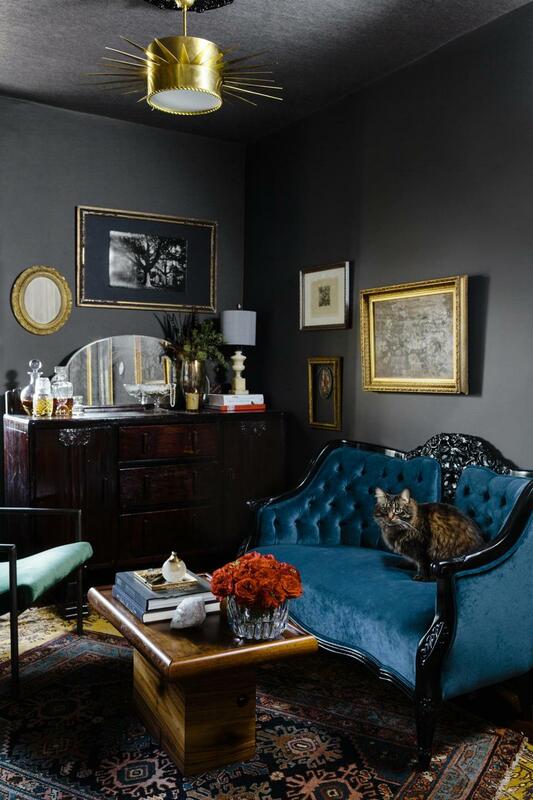 The homeowners’ cat, Bingley, perches on the Hollywood Regency-style settee from Vintage Rescues, which has a glossy-black frame and was reupholstered in a blue velvet by Opuzen. “The sapphire and emerald jewel tones on the seating really pop against the dark gray walls,” Wolhardt said. This piece, designedand built by Nick Doriss of Boston-based Doriss Design Workshoppe is an amalgam of repurposed parts. The base was left over from a table Wolhardt chose for its live-edge top, which was used as a headboard in the master bedroom. The top was taken from Li’s childhood desk, and the trim is fashioned from locally salvaged church railings.